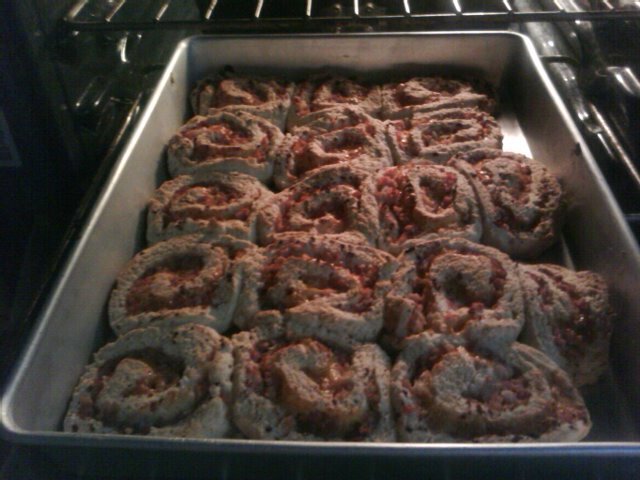 Pinwheels in the oven! Yummy! This is an easy and creative way to use up leftover ham or really any meat. 2) Cut 4 Tbsp shortening into flour mixture until crumby looking. Gently and quickly mix 1 cup milk into mixture. Handle as little as possible to get a more tender crust. 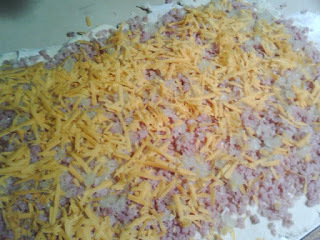 3) Roll dough out into a rectangle, approximately 10 inches by 14 inches. 4) Spread evenly a half pound to one pound of ground or finely chopped ham, diced onion (as little or as much as you like), and a cup or more shredded cheese. 5) Roll up as if making cinnamon rolls. 6) Slice into 1/2 inch slices and place on a greased baking sheet. 7) Bake at 350 degrees for 25 to 35 mins. Cheese should be melted and crust will be golden brown.